“Price of curry leaves is always stable throughout the year. It never fluctuates like onions. The price varies between Rs. 20-40/kg. I found it to be most profitable greens amongst all available variants hence decided to grow it commercially. However initially we were not sure about it therefore for two years we sold greens at customers’ door steps on trading basis to understand demand and supply ratio. 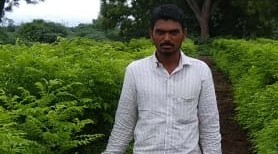 Meticulous analysis of two years sales favoured curry leaves as main crop while other greens as intercrops,” says progressive farmer Mr. Sharanappa Erappa Kuri. In the year 2000, in order to have the feel of the direct sales we started selling the greens (coriander, spinach, fenugreek, mint and curry leaves) at the customer door steps in Koppal city. The sales were good as demand of green leafy vegetables is increasing every day but as it was trading model the profits earned were less because the middlemen had the major share in the income generated. Convinced to sell in retail we decided to grow greens but father and grandfather didn’t approve the idea initially. After explaining the entire production and sales model along with the cost they agreed. The production and harvest process of all green vegetables’ is standard but the highest amount of risk was in curry leaves cultivation as it was new crop for us. We began curry leaves cultivation in 2002. We bought its’ saplings from Gadag KVK and transplanted it in 1acre area keeping the distance of 6 feet row-row while 3 feet plant to plant. The leaves are first harvested after 9months from transplantation then after once 3months that is from 2nd year onwards we get 4 harvests in a year. First 3years the yield is low but then after the production increases. On an average we harvest upto 28 quintal curry leaves in 3 months. Once planted curry leaves continues to yield for 20 years then it can be replaced if the production decreases. Curry leaves varieties cultivated are Malnad and Jawari in half acre each having 500 saplings respectively. Both varieties are completely opposite to one another. 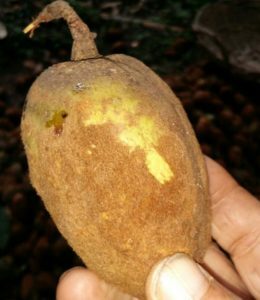 Malnad variety has good colour and texture but less fragrance where as Jawari variety has good fragrance but not good colour. Malnad variety has good demand in market whereas jawari is excellent for good health. To improve the quality and quantity of any of the curry leaf variant it has to be fed with organic as well as chemical agri inputs. In the beginning, 5-6 years green leafy vegetables were grown as intercrops with curry leaves but now as the plants have grown big and covered most of the area it is difficult to grow greens hence these are cultivated separately except spinach. During summer season market demand of spinach is good and it grows well under the shade of curry leaves trees so we continue to grow it as intercrop. Green leafy vegetables are cultivated through seeds. We buy the seeds from Koppal city. Greens are generally attacked by green worms and diseases namely hasiru damari and white damari. To cure these diseases we spray bio-pesticides. We nourish the soil with 2 tons cow dung or goat manure once in a year for curry leaves. Post harvesting we use urea, potash and DAP as it helps to produce new scions in the plant. Irrigation in the farm is done through borewell and pond water that collects rain water. First we use pond water and if more water is required then we use borewell water. Curry plants are irrigated only once in a month. It is mandatory to use chemical farming inputs in curry leaf plantation because when we use organic manures it improves the moisture retention in the soil and keep the plants’ roots moist. As a result we have to add urea to absorb excess moisture and keep the land hard. If urea is not added, the curry leaves will become white thus chemical use is imperative. Curry leaves are not prone to pests or disease attacks therefore no pesticides are used. 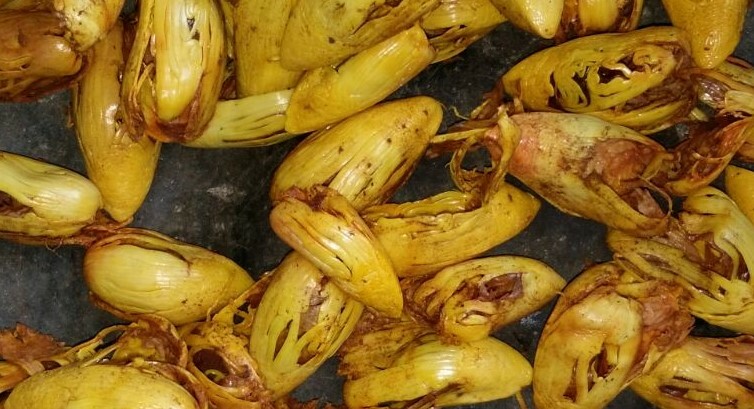 Now we have hired people who sell these green vegetables to end buyers in Koppal city. They come and take greens from the farm. Every day we sell 80 kg curry leaves. Prices are fixed as per the market price on that day. Apart from curry leaves and rest of the green vegetables we have decent contribution to our farm revenues from sale of other vegetables. We get good production of bottle gourd. It is sold at Hubli and Gadag at Rs. 80-100/dozen. Tomato grown is sold at Koppal or Gadag markets. It suffers the most from price fluctuations. Green chilies are harvested once or twice and rest is left on the plant to dry. Later dry chili is sold at Gadag through which we earn Rs. 8-12 thousand/quintal. Green chili is sold in Koppal local market. Onion is purely grown for seedling purpose and is profitable. In future I want to increase curry leaves plantation to 3acres and diversify into dairy and banana cultivation. Incomes in farming always keep swinging between the extreme figures yet we continue it because we are the farmers and feel proud to grow food for all.